Everyone in Philadelphia will focus on the negative, which was the offense from this game. However, the Eagles starting defense did some nice things out there today. Dimitri Patterson made an interception and was involved in the other Eagles turnover. 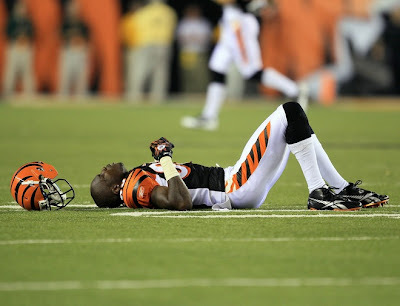 Stewart Bradley rang Chad OchoCinco’s clock. 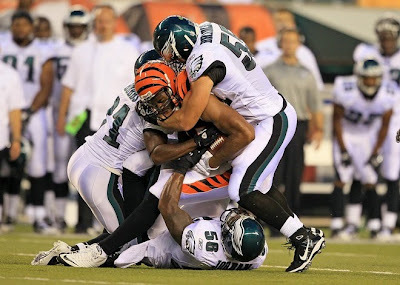 Furthermore, rookie Brandon Graham registered his first sack of his brief NFL career. While there were not a lot of positives on the offensive side of the ball, the defense held the high-powered Bengals offense to just seven first half points. “I still got to go look at the film. You never really play as good as you think and you never really play as bad as you think. When I go look at the film that will confirm how I played tonight." “ On that first series, they came out with that boot and the misdirection. On the running game they gave us a lot of misdirections. We really didn’t game plan this game so next time we will be game planning. “It felt real good. I was really eager to hit somebody and talk trash. It was really fun to play against T.O. and Ocho. Just being on the field having fun. “It felt good because you get a lot of one-on-ones in there and most of the time on the run you get double-teamed. I feel like I hold up well in there just because of my leverage and most of the time that's where the plays are headed anyway, so I like that." “I mean the preparation is definitely different. First of all, if we were playing a regular season game we would have four preseason games to break down film. It is tough when you have only one preseason game. They actually had two, but both teams that faced them were 3-4 defenses so it is really hard to see what they are going to do against us. It is still that training camp mentality where you are trying to prepare yourself and focusing on getting everything install so you are taking care of you base defense and stuff before game planning for the preseason.